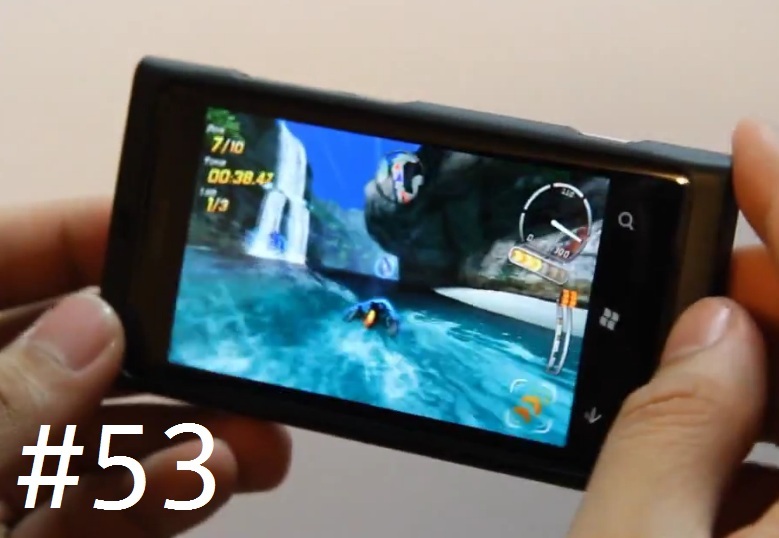 Hey folks, this game for your Nokia Lumia is rather impressive. It’s called Hydro Thunder Go and it’s, well, a racing game on water. You’ve got a range of stunning courses and tons of boats to play/unlock. The attention to detail is astonishing. I really like how I can race into things and break them. Also being on water, you see the rippling, splashing, misting etc. Real nice. Apologies that my video is out of focus in this one so you can’t tell how good the graphics are. The controls are by default, accelerometer based but you can change that in settings. Like #39) Nom Nom Worm (in fact, I think all accelerometer apps are really smooth on WP), using the accelerometer is so fluid and accurate, possibly more so than if I was using touch. It’s quite remarkable. Your boat can also do jumps and if you collect boost packs you can zip along the course super quick. There’s a map on the top to tell you where you’re supposed to be going. There’s race modes, time attack and some other thing I haven’t unlocked yet. This being an Xbox Live title means you can earn gamerscore points for achievements. The game is a little expensive at £3.99. I didn’t pay that, I think I only paid £2.29 when it was on sale. But a quality title to have. “This all-new addition to the legendary arcade hit series, Hydro Thunder GO for Windows Phone 7, features amazing dynamic water physics, transformable rocket-powered boats, gorgeous visuals and over-the-top interactive environments. Blast through the 9 specially made Hydro Thunder GO levels filled with spectacular events and challenges; ranging from tropical pirate ship battles to collapsing ice caverns on the arctic circle, from UFO invasions to lost dinosaur islands. Choose your ride from the selection of 12 sleek powerboats and goofball bonus boats, all with their own unique performance and handling, including classics such as Miss Behave, Rad Hazard and Tinytanic. Fantastic detailed environments rendered with reflections, dynamic lighting and animations. Earn bragging rights by competing on the Xbox LIVE Leaderboards, by battling against your friends’ Ghost recordings and by earning Xbox LIVE Achievements.